Your wedding is said to be the happiest day of your life. A day when all of your family, friends, and other dear ones gather to celebrate the love between you and your chosen one. It all sounds pretty idyllic, but the flip side to this familial harmony is that planning a wedding is one of the most stressful life events that you can ever put yourself through. It's such a gargantuan task. You have to make sure that nobody is left out, that the food is going to suit the majority, that the seating plan inspires conversation and not animosity, and that's not to mention all of the little details that make the day, such as flowers, table displays, and color schemes. Although there’s so much to juggle at any one time during preparations that it becomes physically and mentally exhausting, there are a few apps targeted at making your life much easier during this stressful time period. Make sure to use at least some of them to avoid exhaustion. A fully formed wedding is actually the sum of a multitude of different components. Food, officials, clothes, venues — each one needs to be sourced, arranged, and finalized before the big day. There's so much to do that it would be folly to try and keep track of it all in your head, or even to delegate tasks to individuals such as the bridesmaids and parents. Instead, make use of a thorough master checklist that includes everything you need to know. There are many different task managing apps and software available that can streamline the process. Cloud Outliner, for example, will let you create and edit smart lists that can be synced to multiple devices, allowing you to share the burden of wedding planning with others while monitoring how things are progressing. 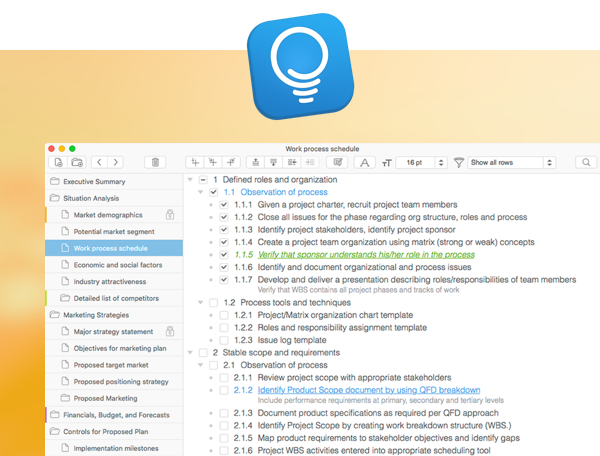 If you prefer to keep things simple, TaskPaper is a minimalist checklist app that gives you a clean, text-based, to-do list to work from. Now put all your tasks in. If you want to take your wedding planning to the next stage, then why not set up an event tracker? An event tracker is not a countdown showing how many days are left until the big day — here we're talking about planning aids. While you have all your tasks in the master checklist, you still need to plan out what exactly do you need to do on each preparation day, so your to-do’s are evenly spread out and you account for enough time for deliveries and other services, such as the wedding cake, bridesmaids’ dresses, and florist, to be performed. Pagico is a brilliant and powerful wedding tracker that can show you progress on the overall wedding project but also prioritize necessary tasks for every day. You can even record specific notes and set reminders to keep absolutely everything in check. Putting all the things you need to do in the master checklist and laying them out in the wedding tracker should’ve convinced you that the complexity of a wedding is something beyond what a regular person can handle. The number of people that you’ll need to meet, pay, and inform of the details can be staggering — which is why many people turn to professional wedding planners. Of course, the popular route is to hire a wedding professional by now. But do you know their secret? 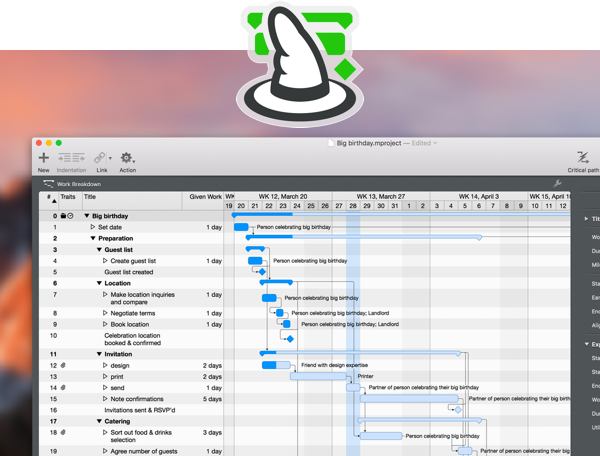 Project management apps! If you want the wedding to go 100% your way, you need to rely on the same tools professionals use to be able to get the same results. One of those tools is Merlin Project Express, which lets you build custom projects from scratch, or select a premade event template to organize every aspect of your wedding. You can prioritize your wedding tasks, track and schedule deadlines, input and keep track of budgets and costs, upload photos, receipts, and contracts, and create individual profiles for everyone involved in the planning. And the more information you throw at it, the more it can do for you. In fact, the only thing Merlin Project Express can’t do is remind the Best Man to bring the rings. Luckily, you already have that covered with TaskPaper! Weddings are all about visuals: the dinner setting, the reception, the way everyone’s dressed, the interiors and exteriors. No doubt, you already have most of that pictured in your mind. But now it’s time to share with others. The easiest way to do this is to create a wedding mood board with Inboard, which can organize all your ideas, whether they come as screenshots, photos, or drawings. Get others to collaborate on your inspiration board as well and assess all wedding details against your original idea to maintain the same vibe throughout. It’s a well-known fact that anticipation of the event can often equal the emotions derived from the event itself. So why not just create a few countdown timers for all the important events leading up to your wedding? Whether it’s your bachelor or bachelorette parties, or a wedding rehearsal. WaitingList allows you to create quick and beautiful countdown timers that also notify you when they run out, so you never accidentally miss anything you’ve been organizing for so long. By now, it’s probably no surprise to you that weddings are expensive. An average U.S. wedding costs well over $30,000, and it’s one of the most common personal loans to be taken by millennials. But worry not. With careful planning and budgeting ahead, you can bring the cost of your wedding down as much as possible without sacrificing any joy. Your big helpers here are MoneyWiz and Chronicle. 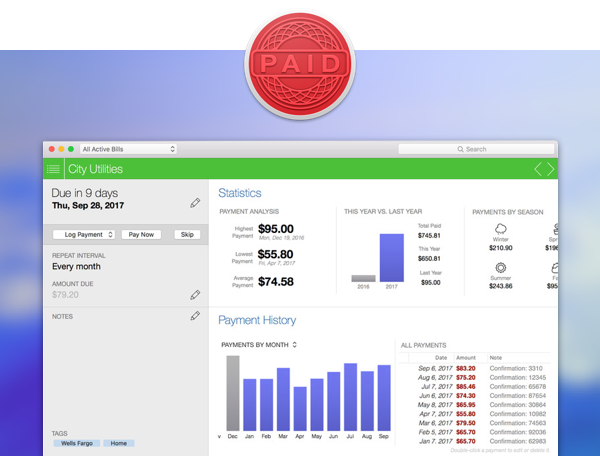 MoneyWiz takes care of your overall budget, helping you figure out your ceiling for each wedding category based on your income and savings. Chronicle, on the other hand, makes it easy to prepare and pay for all the bills as soon as they come in, avoiding late fees on already expensive services. Finally, make sure to cross-reference your budgeting in your wedding tracker and project manager for complete transparency. Perhaps, this is the first question people are going to ask you after you tell them you’re about to get married: Where? You probably have a city in mind already, but finding the right venue can prove to be no less of a challenge. To make sure all your venue ideas are tracked and written down, just use your wedding tracker Pagico together with MoneyWiz, so you’re only looking at realistic places. Once you find the place, here’s another hack to help you keep track of all the things that need to be done in the venue — Home Inventory. Generally, it’s an app to list all furniture or other items in your house, but you can use it for your wedding to make sure that all the interior and exterior decorations and furniture pieces are in place. And just before the big day, keep your eyes on the weather with Forecast Bar to make any last-minute changes, if necessary. Guests are essential to every wedding. You want to make sure that your family and friends accompany you as you move to the next stage of your life. But how to make sure you don’t forget to invite anyone? The best way is to start thinking about your guest list early. And there are apps to help you here too, of course. You can put all your guests in a separate checklist with Cloud Outliner or track them all in Pagico, your wedding tracker. After you confirm that all guests you want to see are on the list, you can move on to creating and printing custom invitation cards, which can be easily done with Swift Publisher — a powerful, but beginner-friendly, desktop publishing app for Mac. Your wedding day is the biggest and best day of your life. Of course, you should shout about it from the rooftops. Everyone should know you’re getting married. In fact, you should make a website about it! You’re much more likely to keep in touch with people online rather than in person these days, and a website is the best way to keep everyone in the loop with regards to your wedding. 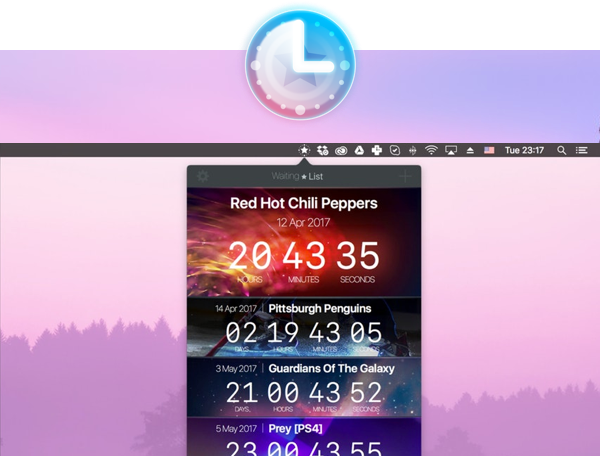 Putting up a temporary site that shows essential details like times, dates, venue, dress code, and menus in one place lets people check it out at their leisure. You can also set up a link to a wedding gift list or donation site should you be asking for help funding a honeymoon instead of gifts. RapidWeaver is the quickest and easiest way to build a website on Mac. Using this app to build your wedding page is as simple as dragging and dropping elements into place. Images, logos, colors, and fonts can be customized according to your preferences, and the whole thing works seamlessly across smartphones, tablets, and desktops. You don’t even have to so much as look at a line of code! No matter the scale of the event, this is the day you going to remember for the rest of your life. So make your memories so much more vivid by writing down your thoughts in a family diary with Journey. Imagine yourself coming back to those notes in 10, 20, 30 years and reminiscing. Wouldn’t that be beautiful? And when the big event is over, create and publish your own wedding book with Swift Publisher, the same app you used to create your wedding invitations, to have something you can show to others in person for years to come. That’s it. There is no need to manage your wedding with pen and paper anymore, or even hire expensive wedding planners. By using about a dozen apps listed here, you can create your perfect day without breaking a sweat. And best of all, all these apps, along with 120 more, are available on Setapp and you can try them free.